The last time Josef Newgarden, Robert Wickens and Alexander Rossi raced each other were in the inaugural 2010 GP3 season. Wickens and Rossi were very competitive back then. But Newgarden settled back to the US while Rossi and Wickens battled it out in the WSR 3.5 by Renault. Now: a rivalry is back. 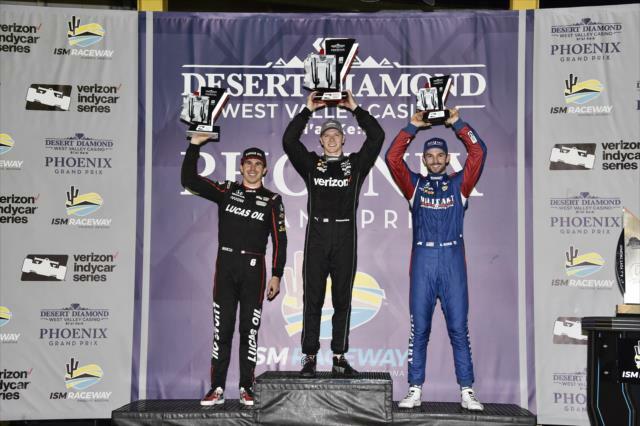 But it was Josef Newgarden managing to swipe the race from underneath Wickens enroute to win the Desert Diamond West Valley Casino Phoenix GP and thus giving Penske their 198th Indy Car win. But the driver of the night was Alexander Rossi who made an unprecedented 53 passes coming from 2 lap down to steal the final podium spot. It all began with polesitter Sebastian Bourdais leading the 1st 40 laps while Dixon, Wickens, Pagenaud, and Rossi swiping position by position. The drama began when rookie and 3rd generation driver Pietro Fitippaldi driving for Dale Coyne brushed the wall thus bringing the 1st yellow of the race. And there is where the action began when Bourdais and Rossi struck their perpestive crew members, and thus resulting drive-thru penalties for both drivers right after the restart losing 2 laps. On lap 124,AJ Foyt's rookie driver Matheus Leist enter for pit service. But it was so fast that the left-rear tire was not secured thus losing 9 laps. Will Power had a battle with Ed Jones not knowing that Rossi was unlapping himself. That caused for Power to go wide scraping the wall at the same time, thus ending his day with a broken suspension. But there was no yellow. It also happened to Juncos Racing driver Kyle Kaiser on lap 174. And during that time, Rossi was surging managing to get back on the lead lap. Bourdais was not so fortunate. Just as Rossi was about to pass the Schmidt Peterson paid of Wickens and James Hinchcliffe, Ed Jones #10 Ganassi car plowed into the wall on lap 229. Newgarden and Dixon elected to get fresh rubber while Wickens, Hinchcliffe, and Rossi elected to remain on the track. It would become costly when the back marked cars were called into the pits so all lead lap car can battled it out. After 2 rounds, Hewgarden jumps to 1st in the point standings followed by Rossi with his 2nd straight 3rd place podium trailing by 5 points. Bourdais is 3rd 7 points back followed by Graham Rahal and Ryan Hunter-Reay completing the top 5. Hinchcliffe holds 6th followed by Dixon after finishing 4th. Wickens' maiden podium resulted a jump to 8th. Tony Kannan and Marco Andretti round up the top 10 as they head out to Long Beach. Last edited by Placid on Tue Apr 10, 2018 2:10 pm, edited 1 time in total. As I remember Rossi passed 53 competitors over the course of the race. I wonder if that has EVER been done in F1. Yeah, yeah, I know, apples to oranges. Still Liberty Media could learn from the current generation of Indycars. What a great race! As a SPM fan I was happy also, too bad they didn't pit one car to split the strategy. I'm with Mort Canard re the current generation of Indy Cars. These first 2 races have been great. Nice to see Rossi and Wickens getting along well too. Unlike F1 the races are available on YouTube. I've started watching old CART races that way after getting into Indy last year. I still struggle with ovals but I think it's a cultural thing, they're just not what I grew up with. Yea I know about the YouTube thing. I just need to get around to catching up.